I spent a week doing work experience at Reuters, the huge news organisation owned by Thomson Reuters. Reuters has more than 2000 journalists around the world and it covers everything from wars to elections to financial markets. Along with providing some consumer news on its websites, Reuters speciality is providing news to its financial market clients and media clients. For the majority of the week, I worked with the lovely Jane and her multimedia team. As an internet kid, and a blogger, it was fascinating to see how such a giant news organisation is using social media. Reuters is currently focusing on Facebook Live. I also now see the challenges of coordinating text, pictures and video in such a large organisation. I was in the newsroom the day after the tragic Nice attack, and while the mood was sombre, it was exhilarating trying to chase down sources and material for the story. The Reuters team pieced together the story professionally and doggedly. One of Reuters' great strengths is news photography. 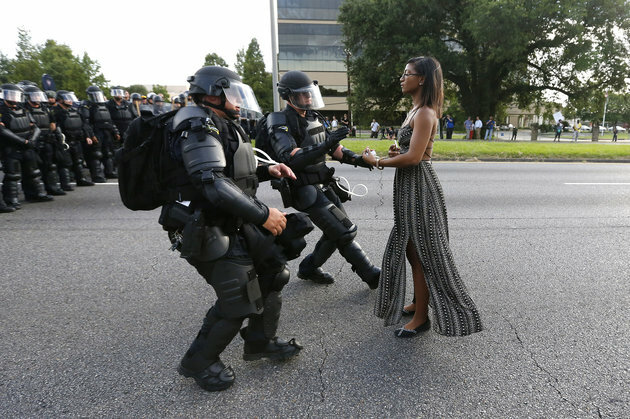 You may remember the viral photo above that circulated amidst the Black Lives Matter movement - this was shot by Reuters photographer Jonathan Bachman. I spent some time learning about how they produce and distribute photos to clients, and what happens when a story breaks. Reuters have some of the most incredible photographers in the world. A particularly great one is Goran Tomasevic. You can check out his stuff on The Wider Image HERE (a really cool website focused on Reuters photojournalism). I helped out on a TV shoot in a North London primary school which has a programme to teach children about migrants and refugees. All of the kids were intelligent, and it was heartwarming to talk to them and listen to how much they cared about the issues. The school also has children at the school from refugee backgrounds. It was deeply touching and at times heartbreaking to hear some of the stories of these kids. You can check out the article HERE and the TV piece on the Reuters TV app. A speciality of Reuters is their financial journalism. While stock markets and economic data aren't something that would normally get my heart racing, it was fascinating to see what Reuters does, and how important it is to financial markets. I spoke at length to Swaha, a Breakingviews journalist about her career in journalism. Swaha is hands down one of the most insightful and inspiring women I've ever met, and she (perhaps without even intending to) gave me some highly influential life advice. You can see her articles HERE. On the evening of my last day at Reuters, there was an attempted military coup in Turkey. It was a major fast moving global news story. I sat glued to my screens monitoring twitter, websites and various TV news channels. Reuters was quoted across all of these sources countless times. It took all my willpower not to race back into the newsroom at Canary Wharf to see if I could help. Thanks to everyone at the Reuters newsroom who were so welcoming and generous with their time, and for giving me the chance to contribute in a very small way. This was so interesting! I was just wondering how you got the work experience in the first place - it's something that I'd be very interested in doing. Thank you!